Decorative Banner #3 is a simplified version of Decorative Banner #2. Instead of cutouts the banner is crafted from a solid sheet of metal, with the same choices of copper, brass, or nickel silver. 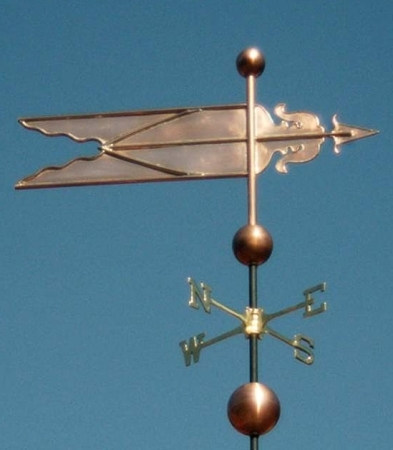 By eliminating the cutouts we are able to make this weather vane as a less expensive alternative. Optional gold or palladium leaf accents can be specified when you order. Gilding will remain bright for many decades whereas the ferrous metals will darken and patina. Both looks are beautiful and a matter simply of personal preference. Banner Weathervanes originally evolved from cloth banners depicting coats of arms which were flown from castle ramparts. The cloth banners wore out too quickly and were eventually replaced with banners made of copper. 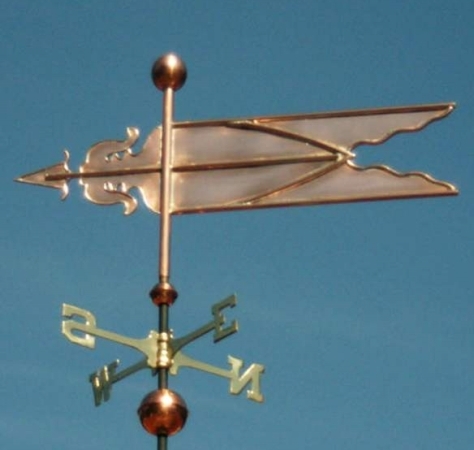 Some banner Weathervanes still depict coats of arms but many evolved to more abstract designs over the centuries.